Theresa May has raised concerns about human rights in Saudi Arabia during talks with the country's crown prince. Mohammed bin Salman has begun a three-day UK visit amid protests against his country's role in the war in Yemen. The PM said ties with Saudi Arabia had saved hundreds of UK lives but she had urged full access for humanitarian aid in Yemen and a political solution. Labour leader Jeremy Corbyn accused the government of "colluding" in war crimes by selling arms to Riyadh. The 32-year-old crown prince, seen by some as a modernising force in the Gulf State, held talks with Mrs May and cabinet ministers at No 10 ahead of a summit at Chequers on Thursday. He has already had lunch with the Queen and Duke of York, and is due to have dinner with the Prince of Wales and Duke of Cambridge. The crown prince, who is regarded as being heir presumptive to the 82-year old King Salman, said there were "huge opportunities" to boost trade between the two countries while the UK and Saudi Arabia had to work together to deal with "failed states...terrorist and extremist organisations" in the Middle East. The UK hopes to capitalise on Saudi plans to open up and diversify its economy by agreeing up to £65bn in mutual trade and investment opportunities over the next 10 years as well as a significant role for the UK in advising on the modernisation of the Saudi schools system. But there were some protesters outside Downing Street demonstrating against the killing of Yemeni civilians in air strikes by a Saudi-led multinational coalition - backed by the UK and US - that is battling the rebel Houthi movement. 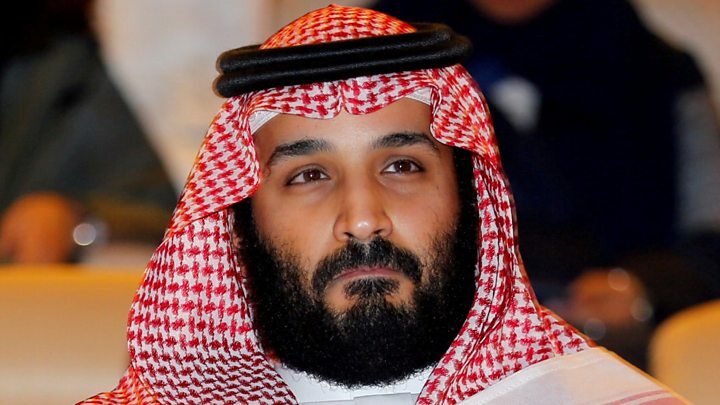 The crown prince is credited with kick-starting economic and social reforms in the conservative desert kingdom, such as the upcoming lifting of the ban on women driving. In a statement following the talks, Downing Street said Mrs May had offered assistance to "progress and intensify these reforms, particularly on women's rights, and on universal human rights". The prime minister expressed particular concern about the case of Raif Badawi, a Saudi blogger sentenced to 1,000 lashes and 10 years in prison for "insulting Islam" online. Many have criticised the crown prince's decisions to intervene in Yemen and impose a de facto blockade of neighbouring Qatar, as well as crack down on perceived opponents of his policies. When this relative novice on the world stage arrives in London on his first global tour since taking office, he will be granted the reddest of red carpets. The Crown Prince is looking for international support for his internal economic reforms while at the same time trying to offer reassurance to nervous international investors. And the British government is keen to transform a security and defence relationship into one that includes broader economic ties as well. The UK also has an unashamed appetite for inward investment from Saudi Arabia. In other words, post-Brexit Britain will need allies, markets and money - and the Saudis are high on the UK's wish list. The conflict in Yemen is seen as part of a regional power struggle between Saudi Arabia, which backs the government, and Iran, which supports the Houthis but denies allegations that it is sending them weapons. According to the United Nations, more than 9,000 people, over half of them civilians, have been killed and more than 52,000 wounded in fighting in Yemen since March 2015. Speaking earlier at Prime Minister's Questions, Mr Corbyn urged Mrs May to use her meeting to call for a halt to "the shocking abuse of human rights in Saudi Arabia", which he claimed included a sharp increase in the arrest and detention of dissidents, the torture of prisoners, unfair trials and executions. The PM responded by saying the UK's historic links with Saudi Arabia had saved the lives of potentially hundreds of people in this country, but she would be "raising concerns about human rights". Mr Corbyn added that 600,000 children in Yemen had cholera "because of the Saudi-led bombing campaign and the blockade", and asked why British arms sales to Saudi Arabia had "sharply increased". "Germany has suspended arms sales to Saudi Arabia but British arms sales have sharply increased, and British military advisers are directing war," he said. "It cannot be right that her government is colluding in what the United Nations says is evidence of war crimes. Will you use your meeting today with the crown prince to halt the arms supplies and demand an immediate ceasefire in Yemen?" Image caption Billboards next to London's A4 advertise the Saudi crown prince with the hashtag "#ANewSaudiArabia"
Mrs May told the Commons everyone was "concerned" about the humanitarian crisis in Yemen. She said she had raised concerns about the Saudi blockades of ports in Yemen during a meeting in December, and it withdrew. "This vindicates the engagement that we have with Saudi Arabia, to be able to sit down with them," she said. "Their involvement in Yemen came at the request of the legitimate government of the Yemen, it is backed by the United Nations Security Council and as such we support it." The prime minister's official spokesman also rejected Mr Corbyn's claims that British military advisers were "directing the war". "We're not a member of that (Saudi-led) coalition; we're not involved in carrying out strikes, directing or conducting operations, or involved in the targeting decision making process," he said.